Clearly I need to cave to my cravings and add some rough hewn wood to our home. It's not just the Restoration Hardware variety (although I can't deny the seductive powers of their stores & catalogs), it's the even rougher planks of reclaimed wood that have the kind of warmth you just can't mimic in a factory. Being less shabby and more chic (and owning it), this look is really only successful for me when paired with glamorous details. Chandeliers, mercury glass, linen and clean white walls are just what the good decorator ordered to make those aged planks look so good. It's all about contrast, right? This is the interior design equivalent of high-low dressing. 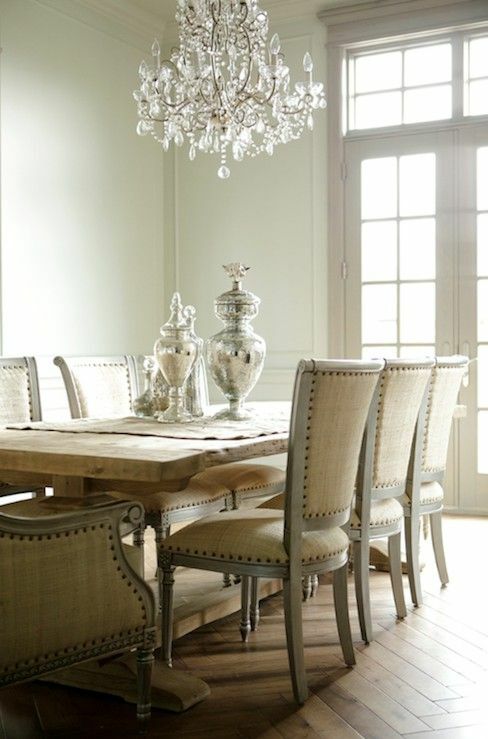 It's the tension between the finery of a chandelier with the flawed nature of the rough wood. Contrast, baby. Adding more complexity to it: the ideal piece needs to be open underneath to hold two benches between the legs. Happy me: this console from Hickory Chair is everything I could possibly want and more. The elegant legs. The planked top. That French plaster finish. Hello, handsome! What's interesting is that I saw it and loved it a few seasons back at High Point Market and loved it but had no need for it. Fast forward to today... I could really use this in my life. Also... you can add optional nailheads to it. Which you know I love! You might see this as "meh" but I'm really crazy about this console. It's just gorgeous and solves several needs at once. How to decorate it? Lamps won't work because visible cords would drive me crazy. Sad but true. I do need some height though, so the plan is to top it off with tall mercury glass candlesticks. Height and shimmer: check. I like these from Pottery Barn, since they are classic and not overly fussy. Plus, their Paperwhite scented candles are nothing short of heavenly. Height and subtle (but fantastic) fragrance in one fell swoop. I'm learning this truth: Spend a small bit and invest in the real thing: flowers. The $10 a week it takes to purchase a bundle of flowers from your grocery store is a happy investment. Put them in a classic clear glass cylindrical case like this one or buy in bulk here and make yourself instantly happy. Seriously, I'm always grateful when I get blooms home. Any flowers. Be they Instagram darlings (peonies and hydrangeas, anyone?) 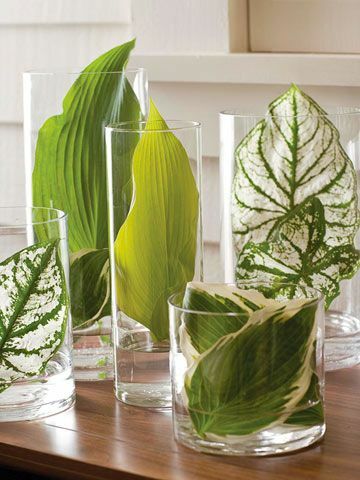 or simply a few random green leaves, a few nature-filled vases scattered around your house is a guaranteed mood booster. There's no denying my love of books. You can bet I'll be adding a stack or two to this console. They are kid-friendly (remember this will be floating behind my sectional and exposed to what s sure to be one or two run-ins a week from my tutu-wearing mini mes). Surely you've purchased enough by now, but if you're looking for suggestions I'm loving the Louboutin book (those gold edged pages are gorgeous and the shoe filled pages are sensational), Tory's book is just as colorful and chic as you might imagine and any title celebrating the French Riviera gets high marks in my book (no pun intended). On a side note: book costs have risen quite a bit. 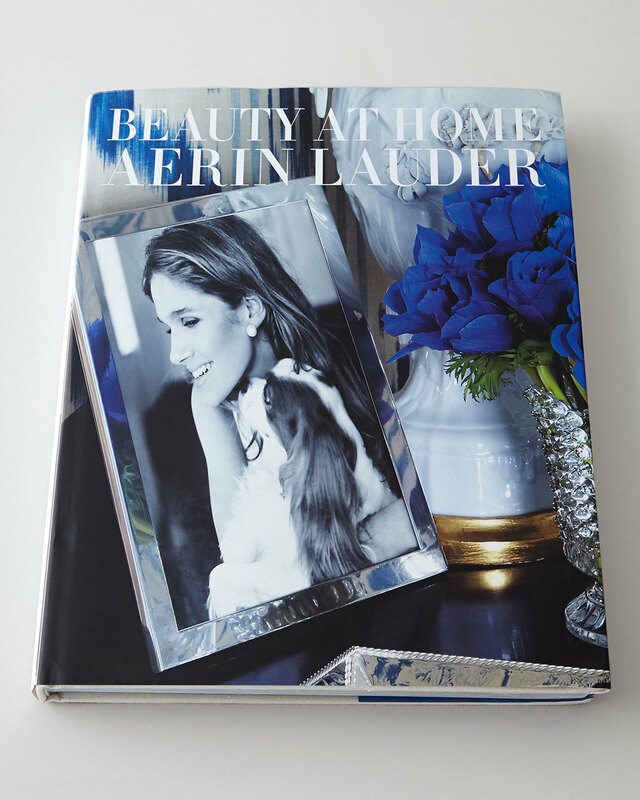 Less pricey (but still content-rich and good looking) options include Miles Redd's Big Book of Chic ($75), Scatter My Ashes at Bergdorf Goodman ($35) and Beauty at Home by Aerin Lauder ($60) All wonderful additions to your collection. Speaking of pretty things around the home... a touch of gold and a pretty sparkling accent is always welcome on a long surface. I wish I could tell you I didn't love these gold-leafed amethyst crystals but I do. I find them intriguing and they are even more mesmerizing in person. No two are ever alike and that adds to the appeal of minerals. Add a quartz cluster or one of these dolled up amethyst specimens to the stack of books for interest and a dash of glamour. Never mind the haters who say it's trendy: it might be, but mineral specimens will always be attractive and great conversation starters long after the trendy peeps have lost interest in these natural wonders. And that's it, friends. That's my plan to add some of this rough-meets-polished chic to my home. Hope you love it. The console, some pretty tabletop acquisitions and voila... a touch of France is born. Happy Sunday to you!